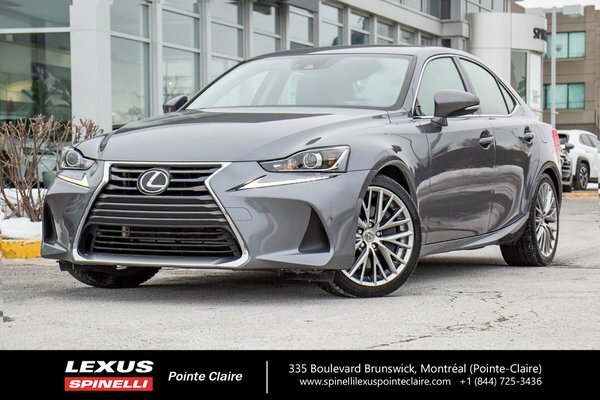 Home > Used Vehicles > 2017 Lexus IS 300 GROUPE LUXE, 2 ENS. DE PNEUS, BAS KILOS! This 2017 LEXUS IS300 AWD with LUXURY package is like brand new. Only 20 394 kms! Only one owner. Taken in on trade from one of our longstanding loyal customers for the all new 2019 Lexus UX hybrid. Purchased new and faithfully maintained at Spinelli Lexus Pointe-Claire. Never accidented. CARFAX and Lexus vehicle history report are available. Remainder of Lexus warranty until April 15, 2023 or 110 000 kms. 3.5L V6 producing 255 hp. 6 speed Super ECT automatic transmission.